So, I expect you’ve heard about the change from the SEM to I-SEM which was due to change in October next year, but it was announced this week, (23 November 2016) at a Senior Stakeholder meeting to postpone the go-live date of the ISEM to no later than 23 May 2018. It’s the biggest change to the Irish Power Market for ten years. The SEM Pool is being abandoned in favour of a new bilateral market, designed to look more like the power markets in other European countries. That’s all very well, you might ask, but how does it affect me as a consumer? Well, it might not immediately affect you, but contained within the new rules that set out how power is traded between generators and suppliers are a number of opportunities that could potentially allow you to make some money or reduce the cost of your electricity bills. The current SEM pool is a bit of a simplified, one-sided market, where prices are set according to a forecast of what customers across the country will use each day and the power plants used to meet that usage. As a bilateral market, I-SEM will allow a lot more participation in setting prices by the demand side – that’s you, the consumer. 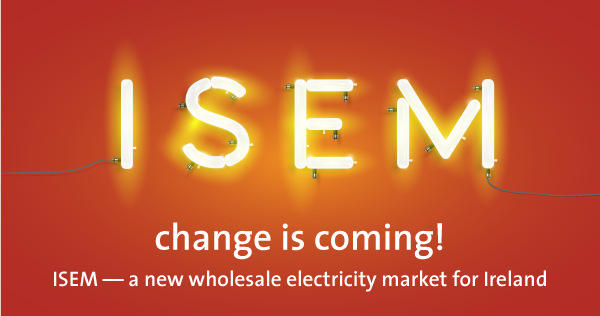 I-SEM allows suppliers to bid a price for the demand they’ll use each day in an auction. These bids are matched up with offered prices from generators and an auction ‘clearing price’ is set for each hour of the next day. After that daily auction, however, the market remains active with buyers and sellers continuing to trade power right up to ‘gate closure’ an hour ahead of real time. After that ‘gate closure’, things get really interesting, with the System Operator continually buying more power or turning down power production to match demand and it’s this greater activity that may provide opportunities for some customers. I-SEM introduces the concept of ‘balancing’ that doesn’t exist in today’s SEM. Basically, balancing means honouring your commitments in the market by delivering or consuming power according to the profile and prices nominated to the System Operator. If this is not done, consuming more (or less) power than was said (or failing to generate if you’re a generator) you can be hit by the Imbalance Price for any shortfall or surplus. These Imbalance Prices have been as high as £1,000/MWh and as low as minus £100/MWh (yes, I-SEM can have negative prices) in the GB market, so there’s a pretty good incentive to stick to what you said you were going to use as much as you can. However, if you have control over your consumption, there are potentially some good opportunities to make some extra money. Suppose you have a factory consuming a steady 10MW. Your supplier will have purchased the 10MW of flat energy to supply you and you’re both pretty safe from the Imbalance Prices. However, if your supplier sees high prices coming up, and you can turn off everything in the factory for a short period, then the 10MW of purchased energy can be sold back in the market. At a price of €1,000/MWh, that could make nearly €10,000 each hour for doing nothing! Money can also be made in a similar way by offering this flexibility to turn down your demand to the System Operator who can call on you, and pay you for it, when the system is running short of energy. It even works the other way – if you have demand that you can increase, to charge up storage heating for example, you could turn this on during the periods where prices are very low – in fact, if prices are negative, you would be getting paid to use electricity! Of course, there are also some potential downsides from I-SEM and we can outline them in a separate article. We will keep you updated throughout the process of moving to ISEM and as always we are here if you would like to discuss the strategy that will work best for your requirements..